The last major Atlantic Yards case to go before a judge is the one challenging the Empire State Development Corporation's (ESDC) September approval of the Modified General Project Plan (MGPP), in part because the ESDC board was not (allegedly) told the details of how the deal for the Vanderbilt Yard was renegotiated. I'll have a broader preview before the court hearing next Tuesday, but first want to point to a key point of dispute between the ESDC and the groups (led by Develop Don't Destroy Brooklyn) bringing the case, which is consolidated with a similar suit brought by groups that are part of BrooklynSpeaks. The petitioners assert that the Vanderbilt Yard deal points to a project that would last some 22 years rather than the promised ten years. The ESDC claims they're wrong, and buttresses its case by pointing to a set of documents that has not been made public. 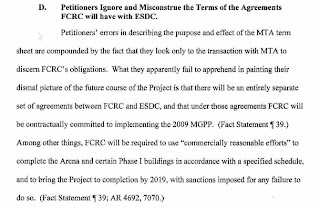 As required by the 2009 MGPP, the Development Agreement being negotiated between ESDC and FCRC will require FCRC to "use commercially reasonable efforts... to complete the entire Project by 2019." (AR 4692.) (As used herein, the term "Development Agreement" encompasses the development agreement, interim leases, development leases and ancillary agreements being negotiated between ESDC and FCRC to implement the project. (AR 7067-79.)) 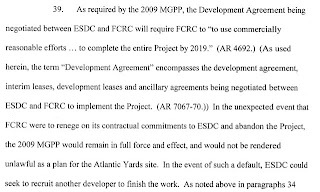 In the unexpected event that FCRC were to renege on its contractual commitments to ESDC and abandon the Project, the 2009 MGPP would remain in full force and effect, and would not be rendered unlawful as a plan for the Atlantic Yards site. In the event of such a default, ESDC could seek to recruit another developer to finish the work. No one other than representatives of the ESDC and Forest City Ratner has seen these documents. So how can they be fairly assessed?